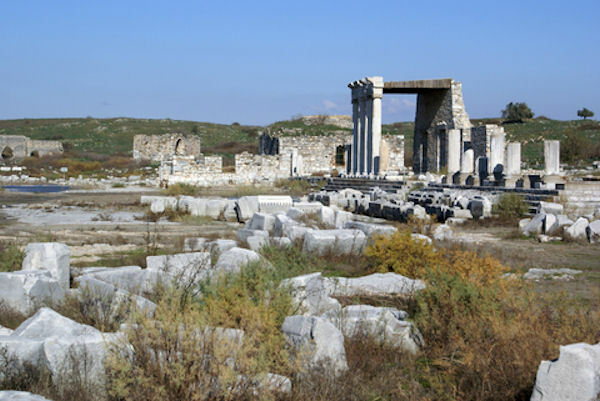 You will begin the day with a scenic drive that will take you to Miletus. In today's world Thales is regarded as one of the Seven Sages of Greek civilization and is remembered for arguing that water is the essence of all things. This argument is significant because it is the first attempt to explain the physical world without reference to a supernatural power. Prior to Thales all such explanations relied on gods or other mythological forces. During Roman days, the city enjoyed a very prosperous period that hosted one of the largest Jewish congregations of Roman Province of Asia Minor. Touring the Roman Theater one can still see the inscription stating that the front seats were reserved for Jewish notables of the society. Contributions of important personalities that were natives to Miletus continued during Byzantine Period when Isodorus of Miletus built in 6th century the greatest Basilica of Christian world that kept the title for another thousand year to follow. Concluding your tour of the ancient site, you will have a twenty minutes drive to the Temple of Apollo at Didyma that dates back to 6th century BC. In ancient times the marble covered road connecting Miletus to Temple of Apollo was one of the most prestigious sacred for pedestrians and was decorated with statues of Branchide dynasty, founders of Miletus colony during 13th century BC. Approaching the site, one can still notice a stretch of the ancient road connecting the temple to Miletus. There were three temples of the ancient Greek civilization that were identical with each other; Temple of Hera on Island Samos, Temple of Artemis in Ephesus and Temple of Apollo at Didyma. Among the three edifices, the one that survives to today with it grandeur and breathtaking columns is the Apollo Temple that also served as one of the biggest banks of the ancient world. Ancient geographer Strabo states in his great work, Geography (XIV.1.5), "The temple is adorned with costliest offerings consisting of early works of art." Concluding your tour in Didyma, you will head on to Kusadasi pier. Please be advised lunch and gratuities are not included. You will want to be sure to bring your camera. A tour voucher is required for children age 6 and older. No charge for children 5 and under.